the spirited poet Joy Gresham. into marriage and then into romance. and C. S. Lewis committed himself to care for her. he doesn’t want to talk about her illness and approaching death. and I want to be there with you then, too. She replies, “I think it can be better than that. Her words hold significant truth for us. 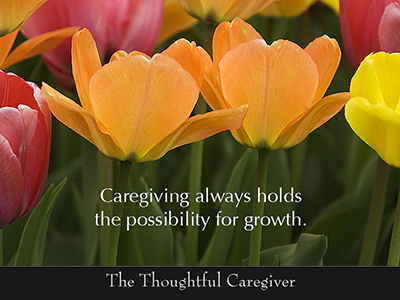 caregiving can be about much more than just managing. Relationships can grow and deepen. People can become more real to one another, more honest. Unusual peace can settle in. Moments can be lived more fully than ever. This entry was posted on June 5, 2007 at 11:43 am and is filed under The Possibilities. You can follow any responses to this entry through the RSS 2.0 feed. You can leave a response, or trackback from your own site.